Dissecting aneurysms of the vertebrobasilar system are a rare but important cause of non-traumatic subarachnoid hemorrhage (SAH), accounting for 3–7% of these cases; and, the majority of hemorrhagic intracranial arterial dissections arise from the posterior circulation., A possible explanation is related to the structure of the vertebral artery since histological studies have shown that the intradural vertebral artery has a thin media and adventitia with fewer elastic fibres. Therefore, dissections of the intradural part of the vertebral artery seem to be more prone to result in transmural dissection and SAH. In contrast, other dissecting vessels often form pseudoaneurysms. In most individuals, the basilar artery benefits from abundant arterial inflow from bilateral vertebral arteries. This anatomic configuration is extremely effective in protecting the brain stem from ischemia in unilateral vertebral artery injury or during therapeutic occlusion performed for treating a dissecting aneurysm on one of the vertebral arteries. However, the outcome of unilateral vertebral artery occlusion is dependent on factors such as the diameter of the contralateral vertebral artery, vascular variants, associated perforators or side branches such as posterior inferior cerebellar artery (PICA) or anterior inferior cerebellar artery (AICA) and can lead to a mortality rate of up to 12% and an additional increased morbidity. Therefore, the choice of therapy depends on the anatomical criteria, which are reflected in the presented classification by the authors in their study. In general, a conservative approach, open surgery and endovascular procedure for treatment of dissecting vertebral aneurysms are possible. Conservative treatment is generally not the first choice for acutely ruptured dissections if other options are feasible due to the high rebleeding rates in the unsecured stage. Rebleeding occurred in up to 71% patients in untreated dissecting aneurysms with a mortality rate of approximately 47%, in contrast to a mortality rate of about 8% in patients without a subsequent rupture. The first 24 hours are of critical importance as up to 57% of the subsequent ruptures take place during this time window. Immediate treatment is, therefore, crucial. As pointed out by the study, because surgical treatment involves a high risk of treatment related morbidity and mortality, an endovascular method is currently the preferred treatment for vertebral dissecting aneurysms. Endovascular treatment options include a wide range of strategies: parent artery occlusion, proximal arterial occlusion, endovascular trapping, implantation of a single or multiple stents (with or without additional coiling), coiling alone, and treatment with flow diverter devices., In general, and nicely summarized in the study, the endovascular therapy can be classified as a deconstructive (parent artery occlusion and endovascular trapping) and a reconstructive approach (preservation of vessel continuity by stent implantation). Decision for choosing one of the procedures is dependent on the present vascular findings and the location of the dissection. Occlusion of an intradural vertebral artery seems to be safe as long as the contralateral vertebral artery is patent to the level of the vertebrobasilar junction and there is no angiographic evidence of vascular supply to other crucial vascular territories like the spinal cord or the posterior inferior cerebellar artery (PICA) in the section of the dissecting aneurysm. In the cases where the contralateral vertebral artery is the dominant or co-dominant artery (category A) and the dissecting aneurysm is not at the level of the origin of the PICA (type I and III), the affected portion of the vertebral artery can be occluded with internal trapping [Figure 1] and [Figure 2] or stent-assisted treatment. Selected cases treated with internal trapping usually achieve good results. As soon as the contralateral vertebral artery is found to be hypoplastic (category B) or the level of the dissecting aneurysm is at the origin of the PICA (category A Type II), a reconstructive approach, preserving the affected vessel should be utilised. Reconstructive treatments, such as stent-assisted coil embolization or an overlapping stent technique, are alternative treatment options for vertebral dissecting aneurysms that are not suitable for deconstructive treatment. A single stent placement in dissecting aneurysms can prevent rebleeding by repositioning the intimal flap and redirecting the blood flow to the true vascular lumen. However, a recent study could show cases of recanalization and subsequent rupture of the vertebral dissecting aneurysms after a single-stent placement. Therefore, the outcome of patients treated with stent-assisted coiling was better than that seen after the single-stent-alone technique, but worse than that seen after internal trapping. Flow-diverter devices were reported as useful tools and have shown some promise in the treatment of vertebral dissecting aneurysms. A high rate of occlusion occurs in intracranial aneurysms, but patients with posterior circulation aneurysms are at a higher risk of ischemia, particularly of perforator infarction. Yet, reports showing the benefits of flow diverters are scarce and the devices need further study. 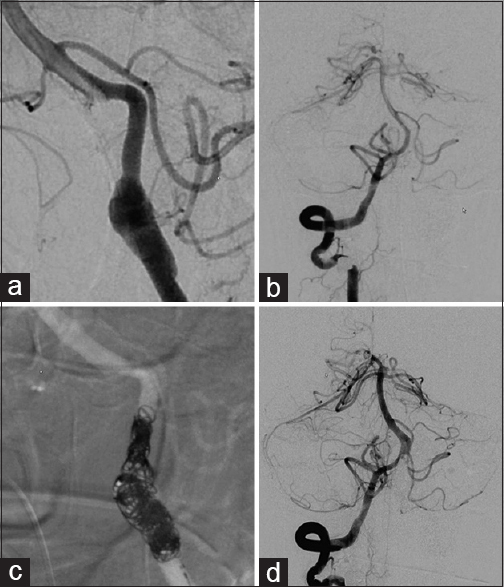 The additionally presented technique of proximal coil occlusion in dissecting aneurysms affecting the origin of PICA (category A, type II) is controversially discussed, though the authors presented two cases with a satisfactory clinical course. The technique is considered as being unable to protect against rebleeding due to the retrograde flow of blood to the PICA along the dissected segment., In these cases, a reconstructive approach should be considered. In summary, dissecting aneurysms are difficult conditions to treat with a high mortality and morbidity. The presented classification is clinically relevant and is helpful in decision making; It divides the dissecting aneurysms of the vertebral artery into easily classifiable types with the classified groups having a direct therapeutic consequence. Rabinov JD, Hellinger FR, Morris PP, Ogilvy CS, Putman CM. Endovascular management of vertebrobasilar dissecting aneurysms. AJNR Am J Neuroradiol 2003;24:1421-8. Zhao WY, Krings T, Alvarez H, Ozanne A, Holmin S, Lasjaunias P. Management of spontaneous haemorrhagic intracranial vertebrobasilar dissection: Review of 21 consecutive cases. Acta Neurochir (Wien) 2007;149:585-96. Shintani A, Zervas NT. Consequence of ligation of the vertebral artery. J Neurosurg 1972;36:447-50. Chinchure SD, Jayakrishnan, Krishna Prasad BP. Endovascular strategies for management of intradural vertebral artery dissecting aneurysms. Neurol India 2018;66:83-9. Mizutani T, Aruga T, Kirino T, Miki Y, Saito I, Tsuchida T. Recurrent subarachnoid hemorrhage from untreated ruptured vertebrobasilar dissecting aneurysms. Neurosurgery 1995;36:905-13. Chung Y, Lee SH, Choi SK, Kim BJ, Lee KM, Kim EJ. Triple stent therapy for the treatment of vertebral dissecting aneurysms: Efficacy and safety. World Neurosurg 2017;99:79-88. 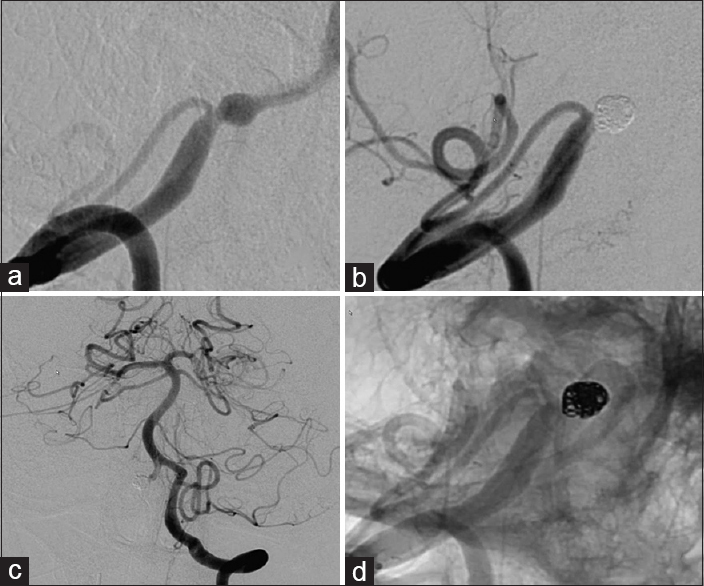 Zhang Y, Lv M, Zhao C, Zhang Y, Yang X, Wu Z. Endovascular treatment of ruptured vertebrobasilar dissecting aneurysms: Review of 40 consecutive cases. Neurol India 2016; 64 Suppl:p. S52-61. Zoarski GH, Seth R. Safety of unilateral endovascular occlusion of the cervical segment of the vertebral artery without antecedent balloon test occlusion. AJNR Am J Neuroradiol 2014; 35:856-61. Takagi T, Takayasu M, Suzuki Y, Yoshida J. Prediction of rebleeding from angiographic features in vertebral artery dissecting aneurysms. Neurosurg Rev 2007;30:32-9. Ahn JY, Han IB, Kim TG, Yoon PH, Lee YJ, Lee BH, et al. Endovascular treatment of intracranial vertebral artery dissections with stent placement or stent-assisted coiling. AJNR Am J Neuroradiol, 2006;27:1514-20. Yamaura I, Tani E, Yokota M, Nakano A, Fukami M, Kaba K, et al. 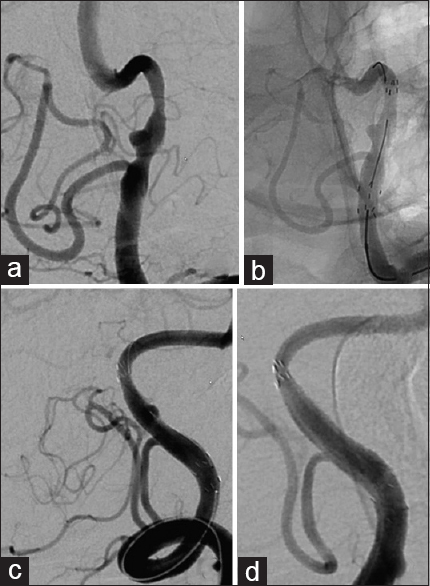 Endovascular treatment of ruptured dissecting aneurysms aimed at occlusion of the dissected site by using Guglielmi detachable coils. J Neurosurg 1999;90:853-6.